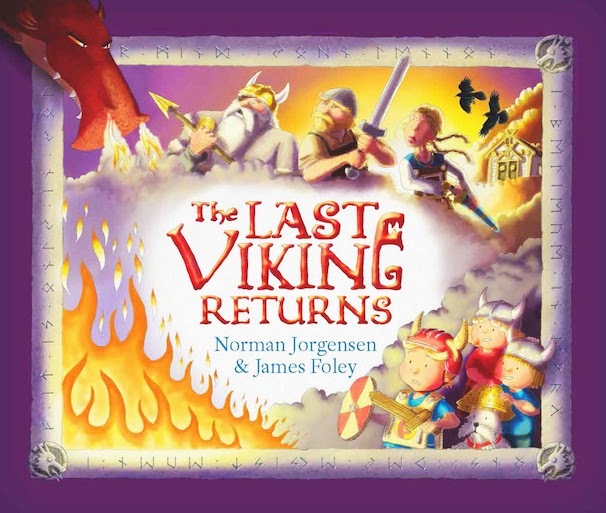 The Last Viking Returns is a children’s picture book written by Norman Jorgensen, illustrated by James Foley, and published by Fremantle Press, 2014. The first thing that will seize children’s attention in The Last Viking Returns is the colourful cover art, hinting at fun, action and drama. Next will surely be the inside cover - a glorious double page spread depicting the story’s main setting, Viking World. This is a theme park dedicated to Vikings and we see a map of the park, the map’s key, advertising for the stalls - reindeer ice-cream or a Bjorn Burger anyone? - all great for visual literacy and we still haven’t started the story! We first met Josh in The Last Viking. The combination of Jorgensen and Foley is a winning one: Jorgensen builds tension and drama in the story - we read of “A pair of sinister eyes peering out from the depths of a dark cave in Asgard.” and watch nervously as the twins clamber aboard a ship due for destruction. We remember the refrain, “What could possibly go wrong?” and hope desperately that Knut/Josh can save the day yet again. Foley’s a master of the visual joke. He gives youngsters so many interesting perspectives and details, they will want to return to the book again and again to check they haven’t missed something. Older kids will love the Nordic runes, and cracking the code they provide. Everyone will love the jokes - The Trollercoaster, the incorrigible mud-smeared littlest Vikings, the Norse gods who love a good berserker, a faithful hound called Wolverine who wears a colander as his Viking helmet. They’ll also become caught up in a dramatic tale where what’s happening in Valhalla is mirrored by what’s happening in the theme park. Be sure to check out the book trailer which will have kids excited to read the book, and The Last Viking books’ website. There are also excellent, comprehensive ACARA linked teaching notes available via Fremantle Press’s website. Above all, The Last Viking Returns is an invitation to play, to have fun and enjoy reading, so grab it soon for the kids you care about.